A loyal steam-powered Dwarven Spider, fueled by magicka from a soul gem that will last for eras. 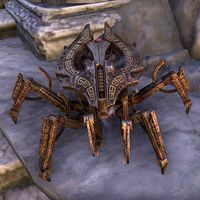 Not to be confused with the Dwarven Spider Pet, Razak's Opus is a pet Dwarven Spider that can be obtained for completing The Mystery of Razak, a quest that takes place in the Razak's Wheel public dungeon in Bangkorai. Its default name is "Cogbucket". The item was originally called "Razak's Toy Spider". The Red Pit Wolves of Skyrim are known for their aggression and ferocity, and you can see that even in their puppies, adorable as they are. They love to play, but that means play-fighting, so expect to get chewed on as you tussle! 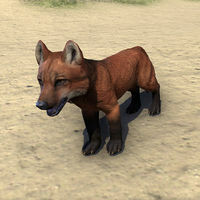 The Red Pit Wolf Pup is a pet available in the Storm Atronach Crown Crates as a Legendary-level reward. Its default name is "Scrapper". 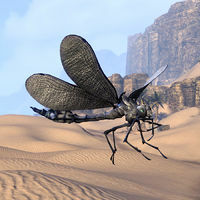 Many a Vvardenfell youngster growing up in the swamps of West Gash or the Bitter Coast remembers spending happy hours playing "dodge-dovah" with these hovering bug-buddies! If hand-raised from larval form, they can become devoted companion animals. This pet is available as an Epic-level reward in Flame Atronach crates. Its default name is "Buzz f'lah". The Rihad Coffee Scorpion is an upcoming pet. Its default name is "Kaveh". 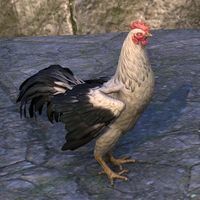 A hardy domestic chicken found all along Skyrim's White River, said to have been originally bred in the old town of Riverwood. Owners grow extremely attached to them, and become outraged if they're harmed. The Riverwood White Hen is available from the Xanmeer Crown Crates as an Epic-level reward. Its default name is "Pecky". 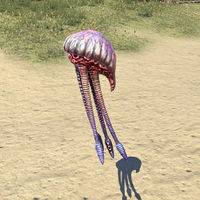 The reddish, or "Rosy" Netches are native to the foyadas of the Molag Amur region of Vvardenfell, where they live in a semi-wild state subject to the occasional round-ups of the Netchimen. The calves, sulfurous odor aside, are quite adorable. The Rosy Netch Calf is a pet available in the Storm Atronach Crown Crates as a Legendary-level reward. Its default name is "Ruby". 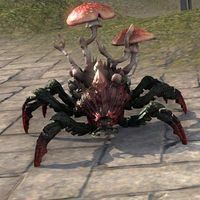 The Ruby Shroom Shalk is a popular house pet on the Telvanni Coast; the sway of its warm red fungus caps as it waddles about in the fireflight of a parlor hearth just says "I'm home" to Dark Elves of a sentimental nature. The Ruby Shroom Shalk is a pet available in the Psijic Vault Crates as an Epic-level reward. Its default name is "Redcap". A perky crab buddy whose rust-colored shell covers a cheerful, inquisitive demeanor. Rufous Mudcrab pets were given out at conventions in 2016. They also came with the purchase of the official mudcrab plush toy (redeemable only on PC/Mac). 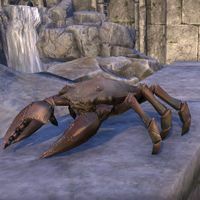 They were originally accidentally given to several players who pre-ordered the Imperial Edition of the game, along with the Pet Nibenay Mudcrab. Its default name is "Crabcakes". They were seemingly intended to be a cash purchase from the Store. The item was originally called "Pet Rufous Mudcrab".